At the corner of Fifth and Cooper Streets, two large residences built in the 1880s represent the height of Camden’s nineteenth-century prosperity and the transition of a fashionable neighborhood following the 1926 completion of the first bridge across the Delaware River to Philadelphia. Anchoring a key intersection within the Cooper Street Historic District, these houses contribute to the National Register of Historic Places’ recognition of Cooper Street’s significance in the nineteenth and early twentieth century, “when industry, commerce, and agriculture combined to make this city the economic and urban center of Southern New Jersey.” They demonstrate transitions from nineteenth-century trades, to real estate development, to the practice of medicine in the houses on Cooper Street. Cooper Street’s role as the major route linking South Jersey to Philadelphia-bound ferries dates from the eighteenth century, but the north side of the street remained undeveloped farmland until the 1840s. Prior to construction of the present houses, earlier occupants of residential structures at 427 and 429 reflected the economy and opportunities available in Camden in the mid-nineteenth century. For example, lumber merchant William Doughten and his family lived in an earlier house at 427 Cooper Street beginning in 1862. Census records indicate that the Doughten household included domestic servants in addition to William Doughten, his wife Abigail, two sons, and two daughters. 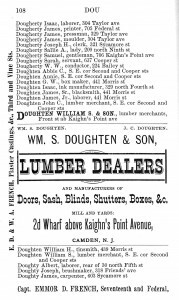 The Doughtens retained ownership of the house as an investment property after the family moved elsewhere in Camden in the 1870s and 1880s. Among the tenants were a dentist, Alphonso Irwin, who had his home and office at 427 from 1881 until 1885, when he purchased the house next door, 425 Cooper Street, which still stands. An earlier structure also stood at the corner of Fifth and Cooper (429). The owner, Lewis Wilkins, earned his living as operator of a livery stable on Front Street, a good location near the ferries that crossed to Philadelphia. 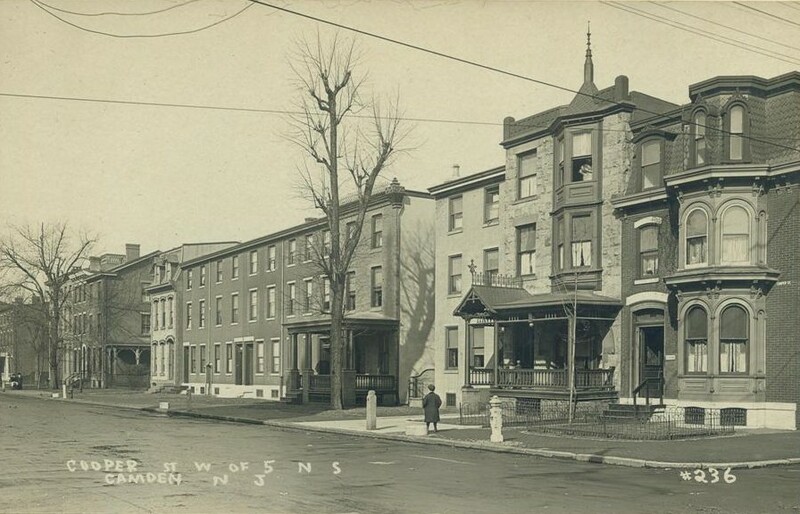 Although Wilkins, his wife Rebecca, and their daughter did not experience prosperity equal to the Doughtens, they owned their home at 429 Cooper from 1860 until 1880, and city directories thereafter identified Lewis Wilkins as a “gentleman” retired from business. Both properties changed ownership during the greatest takeoff of Camden’s population, which nearly tripled between 1880 and 1920, from about 41,000 to more than 116,000 people. Fittingly for a period of such growth, the new houses constructed at 427 and 429 Cooper Street both were built for the families of prominent real estate developers. Much larger and more attentive to architectural fashion than the houses they replaced, the new residences advertised their owners’ success and ambition in business. The first of the two properties to change hands was 429, on the corner of Fifth and Cooper. Lewis Wilkins, the livery stable operator, sold his property in 1880 to Joseph J. Read, a beneficiary of the changing worlds of work and opportunity in the nineteenth century. Born in Camden in 1815, in his youth in South Philadelphia Read learned the craft of coopering—barrel-making—and he practiced this trade in Camden as late as the 1860s. But in the 1860s and 1870s Read also began to buy and renovate houses and at least one office building in Camden, and he amassed enough wealth to also invest in property in Philadelphia and Atlantic City. Established in the real estate business, the former cooper moved to Cooper Street. He had his new house at 429 Cooper Street built in the French-inspired Second Empire style, like the new City Hall under construction in Philadelphia. Very popular in the United States during the 1860s and 1870s, Second Empire was no longer as favored by 1880; it was perhaps a choice influenced by the tastes of Read’s late first wife, who was French, or perhaps a tribute to her. For Read, the new house with the mansard roof, arched windows, and projected bays became the home of his second marriage, to Elizabeth Schellenger (in public records of the late nineteenth and early twentieth century also spelled Schellinger), the widow of a sea captain. Their extended household included Elizabeth’s son William Schellenger, a clerk, and later William’s wife Lillian and their son, Edward. Architect’s plan for 427 Cooper Street. Next door, at 427 Cooper Street, change came in 1889 when the Doughten family sold their former home and investment property to another real estate broker, James White, whose new house was designed to serve as both his office and residence for himself, his wife, and two daughters. (Title to the property was registered in the name of James’s wife, Maggie, a common tactic for protecting the home from any failings or lawsuits against the business.) The Whites engaged the Philadelphia architectural firm Moses & King to design a distinctive home, similar in scale to the house next door but jarringly different in style. 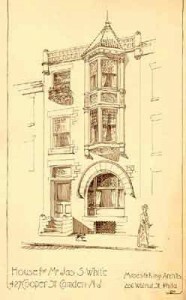 Next to the Reads’ Second Empire residence rose a home that incorporated a strong statement of Richardsonian Romanesque style with a stone arched window on the first floor but also ornamental touches that could be described as Queen Anne, a style that gained in popularity in the United States following its appearance at the 1876 Centennial Exhibition in Philadelphia—two architectural statements in one building, speaking to two purposes as home and office. Moses & King were known for designing churches as well as residences, which may help to explain the stained glass installed over the front door. The new houses at 427 and 429 Cooper Street remained home to the Whites, the Reads, and their extended families until the 1920s. In the early twentieth century, both households included African American domestic servants—at 429 Cooper in 1900, Julia Burse, a 36-year-old widow originally from Delaware, and at 427 Cooper in 1920, a 70-year-old cook named Mary Taylor. At 429 Cooper, the continuing history of the Read/Schellenger family entwined not only with real estate but also with the community of physicians with offices in other houses on Cooper Street. Edward Schellenger, the grandson of Joseph Read’s second wife, became a physician and opened a medical office in his family’s home in 1894. His son, also named Edward, also became a physician and based his practice at this address for a time in the 1940s (upon retirement, he donated the building to Rutgers). The house next door also became a medical office as well as a home in 1922 when the Whites sold to Dr. Oscar Grumbrecht and his wife, Mary (who held title to the property). 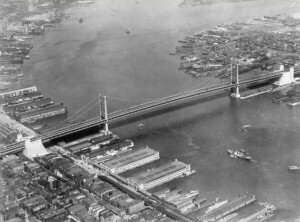 By the 1920s, suburbanization and the construction of the Delaware River Bridge—later the renamed the Benjamin Franklin Bridge—were changing Camden, and so too the occupants and fates of the houses at 427 and 429 Cooper Street. By the middle 1920s, as demolition made way for the bridge and the new Plaza Hotel signaled a more commercial future for Cooper Street, the Schellengers moved to the fashionable railroad suburb of Merchantville. They retained ownership of the 429 Cooper Street house, which was divided into multiple offices, apartments, and sometimes retail spaces, including a dress shop during the 1930s. Next door, the Grumbrechts also moved in the mid-1920s to another house on Cooper Street, and 427 was thereafter divided and rented to tenants. As Camden became a recorded-music mecca with the rise of RCA-Victor, the tenants included a World War I veteran named Edwin Wartman who lived at 427 Cooper from 1929 to 1931 while working as a Vitaphone recording system operator (and later a movie projectionist). During the Great Depression, 427 became a boarding house with boarders and lodgers including factory workers, waitresses, and a draftsman employed by the Works Progress Administration (WPA). The houses at 427-29 Cooper Street are two of seventy-six “contributing” structures of the Cooper Street Historic District, which extends from Second to Seventh Streets. Following an inventory of historic structure by the City of Camden Bureau of Planning, the district was added to the National Register of Historic Places in 1989. The buildings, now joined as a single structure designated as 429 Cooper Street, gained new purposes in 2011 as the home of the Rutgers-Camden Department of History and the Department of Religion and Philosophy. 427-429 Cooper Street on Dipity. Copyright 2012, Charlene Mires. 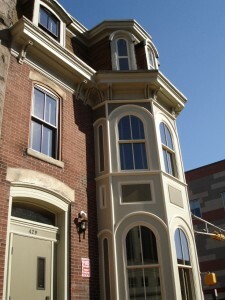 Cite as: Charlene Mires, “Building Lives at 427-29 Cooper Street,” http://publichistory.blogs.rutgers.edu/our-home-in-camden. Please direct any comments or corrections to: cmires@camden.rutgers.edu. Camden City Directories, 1840-1940, Camden County Historical Society. Camden Historic Survey. Camden: City of Camden, Bureau of Planning, Office of Development, 1982. Cammarota, Anne Marie. Pavements in the Garden: The Suburbanization of Southern New Jersey, Adjacent to the City of Philadelphia, 1769-Present. Madison, N.J.: Fairleigh Dickinson University Press, 2001. Cohen, Phil. “Dr. Edward A.Y. Schellenger Sr.” http://www.dvrbs.com/People/CamdenPeople-DrEAYSchellengerSr.htm (viewed July 23, 2012). “Cooper Street Historic District” National Register of Historic Places Nomination Form. Washington: National Park Service, U.S. Department of the Interior, 1989. Dorwart, Jeffery M. Camden County, New Jersey: The Making of a Metropolitan Community, 1926-2000. New Brunswick, N.J.: Rutgers University Press, 2001. Professor of History and Director of the Mid-Atlantic Regional Center for the Humanities (MARCH) at Rutgers-Camden.